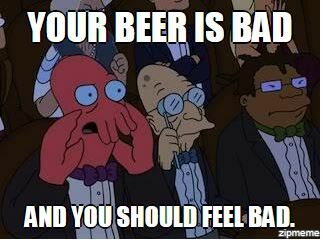 If you are an indy brewer, then you know how much sway that Untappd reviews have. It’s a superb way of getting feedback, especially if you do non-traditional, obscure or experimental brews. Though not everyone may not like your product, but it is a good way to gauge your product’s quality. If you hear something good – let people know about. If you are only keeping an eye out for bad ones, you miss out on making friends who like your product. These are the type of people who will come to your rescue whenever some sort skulldudgery is involved. Our good friends at Behemoth recently got shellacked on Untappd for ‘Dump the Trump’. Rabid users from overseas took offence to a Kiwi brewer making a satiric reference to the current US president. However, fans of the indy brewer showed up in force; no one likes the big bully from the playground messin’ with one of their own! Whenever possible, always ask why the review is bad. In some cases, it might be oxidised bottles or a bad batch. In other cases, non-traditional beers may produce floaters or unusual colours that might offput drinkers. It actually does matter on the session order too – a lager or kölsch finished after a Hop Zombie will dramatically reduce the taste of these easy going beers. Also judging systems can range from person and even country to country: the top rated brewery in the USA is a whopping 4.71/5, while the best rated one in New Zealand is a more conservative 3.97/5. One of our proudest moments was when Carlos and I went to Tauranga to demo our Poke of the Bear. A guy came up to us and pulled up an Untappd thread were Carlos responded to a bad review. Carlos worked with the reviewer and realised the issue was an oxidised bottle. Carlos took the conversation offline and got the user a good bottle, to which the review was changed. The best part was that the guy showing us the thread was not the affected user, rather someone who was following our brewery. He was just stoked that someone on the other end was actually listening! Sometimes its just best to do nothing at all. In such cases you can sift through profiles and see that some people have nothing good to say. This easier said than done. There several instances when I have read troll reviews I would call up Alvin and Carlos and shout ‘Hey did you hear what that scabby, weapons-grade sh!t-gibbon said in that untappd review?’ I know how hard we work on our beverages, and it can be heartbreaking to see someone be so dismissive and cruel.Luckily – in almost every instance we’ve had friends we have made along way stick up for us with good reviews (see point one). In some cases, just biting your tongue is the best course of action, and just let the bad reviews take care of themselves. In short – if you get one of the those shiny 5 star reviews, crack open a bottle and toast them! We have met a lot of these fans in real life, and they soon became great friends to share a drink (or 5) with! This post was brewing around in my head for a while and took a while to incubate. I really want to thank Andy Nyguyen for his thoughtful presentation at the Full Indy Summit in Vancouver, which was titled “Make Friends, Not Fans“, which inspired me to finally write about this. He touched upon many things we were doing right (an perhaps wrong). Though we are in different industries (indy video games vs indy brewing) there are more than a few similarities between the two. I’ll add his presentation here as soon as its available.